NTS Detroit offers a wide range of test and analysis services in a 42,000 square foot facility and at various client sites. Our experienced mechanical and electrical engineering specialists deliver high quality results and fast turnarounds at competitive prices. Whether your needs are for defense, medical, automotive, aerospace, communications, electronics, energy or agriculture, we’re ready to go to work. This facility is also a ISO 17025-compliant organization. Executes 400 HP regen dyno performance testing of EV/HEV power trains in an environmental chamber, with DC supplied by a 600V/600A battery simulator. Staffs specialists in design and construction of high speed back-to-back dyno rigs and controls for EV and HEV motor endurance and thermal cycle testing. 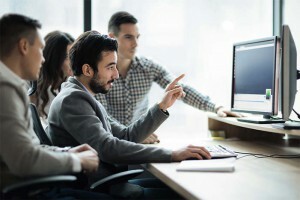 Designs data acquisition and control systems tailored specifically for e-motor and inverter testing including interfaces for CAN, Fieldbus and TCP/IP devices. MTS control systems for programmable load profiles or field data simulation. Cyclic torque to 100,000 in-lb and linear force to 35,000 lbs. Pressure cycling and impulse to 8000 psi at 300 Hz and static fluid to 30,000 psi. Fluid control systems capable of -50°C to +150°C cycling at high flow rates. Pneumatic actuation, cycling, flow, pressure and leakage up to 6000 psi. Ultimate torque up to 200,000 in lbs. Electrodynamic vibration up to 3,000 Hz and 100g. Servo-hydraulic vibration up to 100 Hz for payloads up to 2,000 lbs. 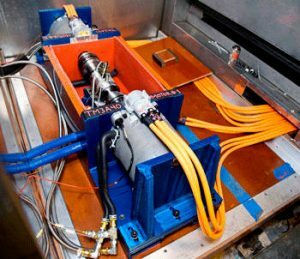 Design and fabrication of fixtures and automated equipment for electro-mechanical operation and monitoring of complex systems during vibration (key-life testing). Vibration control and data acquisition for sine, random, random-on-random, sine-on-random, shock, shock response spectrum (SRS) and time domain replication of field data. Data acquisition on 32 channels up to 100 KHz and 84 channels up to 2 KHz simultaneous for acceleration, strain, load, torque, sound, pressure and voltage. Multi-channel data analyses, including order tracking, spectral density, transfer function, octave bands, loudness and time-domain transient analysis for BSR. Exhaust system and sensor vibe testing with hot air pressure and flow to +1,200°C. Cyclic thermal shock chambers for large samples tested from -50°C to 160°C. HALT/HASS (Highly Accelerated Life Testing/Highly Accelerated Stress Screening and HAST (Highly Accelerated Stress Testing) autoclave. Sand, dust, gravel bombardment; slurry and mud exposure for dynamic tests. Altitude chamber for large samples and smaller, high-vacuum tests. Operational testing in salt fog and humidity chambers. Chemical exposure, high-pressure water spray, steam jet and rain exposure. Motoring and absorbing at speeds to 15,000 RPM and torque over 6,000 ft-lb. 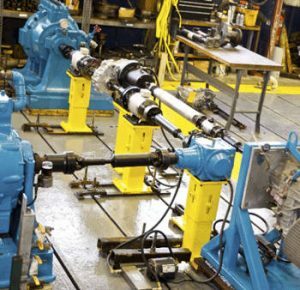 Automated control, monitoring and data acquisition with torque/speed profile, backdrive and shift capability for transmissions, PTUs, gearboxes, axles and driveshafts, along with rotating machinery analysis. Simultaneous application of dynamic axial and/or radial loading to rotating components on geared hubs, spindles and CV joints. Environmental exposure to rotating components including temperature, slurry and salt spray on motors, alternators, U-joints and bearings. Spin testing of various components up to 24,000 rpm. 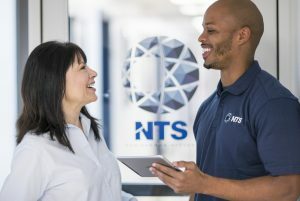 Whatever your project needs: Power supplies, load banks and instrumentation for precision measurement of voltage, current, resistance, capacitance and dielectric strength, NTS Detroit has it. We can design and build automated systems for operation and measurement of complex systems or large arrays of samples being subjected to environmental and dynamic testing. Click here to download the NTS Detroit fact sheet for more details on specifications, tests, and capabilities. Contact us today to discuss your next program!